ALZETA® world-class abatement technologies offer high destruction of organic vapor and process gases, and very low emissions of pollutants such as NOx, hydrocarbons, and CO. Our unique oxidizer designs benefit applications such as semiconductor manufacturing, pharmaceuticals, commercial painting and coating, chemical processing, and many more. Systems are available through ALZETA, and through a number of other companies that have licensed our technologies for use in pre-packaged exhaust gas and VOC abatement systems. ALZETA’s Duratherm “flameless” burner is ideal for high performance VOC abatement. When the burner is fired radially inward to create an adiabatic reaction chamber, the resulting flameless oxidation achieves maximum destruction of difficult halogenated VOCs such as refrigerants, chlorinated compounds, fluorinated compounds, and others—as high as 99.9999% DRE has been demonstrated and verified by EPA. Systems are recognized for their quick response. Units can be started and on-line in less than one minute. The EDGE QR inward-fired Duratherm oxidizer and quench chamber, and inward-fired incinerator burner technology can be licensed to system integrators seeking ultimate performance and efficiency for their VOC abatement systems. ALZETA’s “Graded-Cell” catalyst, patent no. 4,154,568, is the heart of our EDGE GC catalytic oxidizers. When combined with any of our short-flame surface combustion burners and energy saving, plate-type recuperators, we can provide compact, small footprint configurations for both point-of-use and end-of-pipe locations. Systems process most organic solvent vapors. Destruction efficiencies greater than 99% have been demonstrated at modest catalyst operating temperatures. The EDGE GC oxidizer design is available for license. We can assist in system sizing and design integration, as well as provide catalyst and burners for systems ranging up to 15,000 cfm. 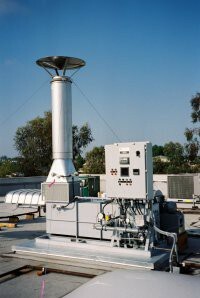 ALZETA’s EDGE SB recuperated thermal oxidizer combines our unique short flame-length premixed surface combustion burner in a more conventional thermal oxidizer design. Benefits include compact size, high DRE, and very low maintenance. Operating temperatures are between 1300°F and 1500°F. Originally designed for the California semiconductor market, the EDGE SB ensures low NOx emissions. More significantly, the short flame-length associated with the SB/CSB burner technology eliminates zones of high combustion temperatures, creating an environment that prevents particle agglomeration when processing VOCs such as HMDS (that forms SiO2). Particles remain as a dry dust rather than forming glass-like coatings along interior surfaces. SB burners, and the combustion chamber design technology, are available for license. All of ALZETA’s oxidizer technologies are easily combined with rotor concentrators to reduce operating costs when processing low concentration VOC streams. The operating temperatures and low pressures associated with the EDGE GC, SB, or QR match well with the flow and pressure ratio requirements of most zeolite and carbon rotors, greatly simplifying system integration. In addition to oxidizer technology designs, ALZETA can provide engineering support for integration into rotor concentrator based systems. Based on the Duratherm inward-fired incinerator burner element, ALZETA’s exhaust gas abatement technology oxidizes waste gases and fumes that can be harmful to workers’ health and the environment, while minimizing the maintenance and plugging concerns associated with the oxidization of particulate forming compounds. Our waste gas burners efficiently and effectively destroy a full spectrum of PFC and global warming gases used in semiconductor manufacturing and similar processes. Except for licensed products, exhaust gas abatement systems are available directly from ALZETA. Allow us to supply a solution for your exhaust gas abatement requirements. For further information on ALZETA’s VOC abatement systems, exhaust gas abatement systems, incinerator burner technology, oxidizers, and more, contact us today. Our team of experts offers unrivaled expertise and experience in the field of abatement technology.